3. Give your little friend a face. Maybe a smile and some rosy cheeks. 4. Rub all over with a bit of beeswax to seal paint color. 5. Choose a bit of colorful wool and pull apart so fairly thin. Coat with a thin layer of glue just wear you are going to attach to top of wooden peg doll. 6. Wait until this dries and then glue your acorn hat on top of hair. 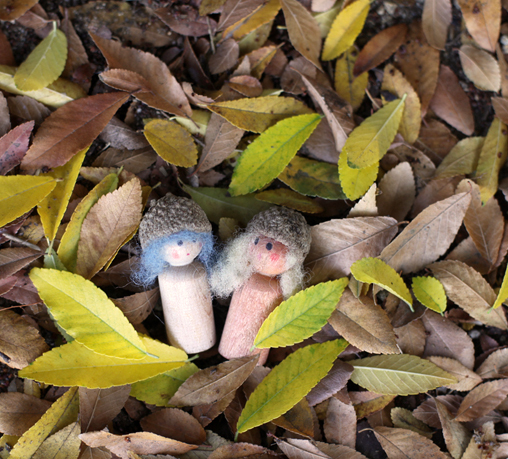 It is so fun to hunt for acorns and it seems every time we do this activity we find different acorn caps. It takes time to coordinate which cap will fit with the little peg dolls but you can always find a handful that will work. If you find your self short on time, loads of people sell these on etsy as well. Last year we didn’t have time to make as I was preparing to have a baby and we found the ones above here. To read more from Elizabeth, hop over to her sweet blog, The Littlest. This is such a cute idea, I love it! I’m going to do this with my kids. Thanks for sharing. You always have the best ideas Elizabeth! We’re doing these this week. Have a whole bunch of acorn hats around the house already – I bet I have like a dozen in my pocket now… 🙂 Someone at our house has a serious stick and acorn addiction! I was looking up the acorn littles that I make and sell on Etsy, just to see where they turn up. Voila, here they are on your blog, how fun! Trouble is, the link you provided was to a different Etsy seller. I have not been doing much on Etsy so that may be the reason for the confusion. I don’t know if there’s anything you can do to change the link, but if so, I’d love the publicity! 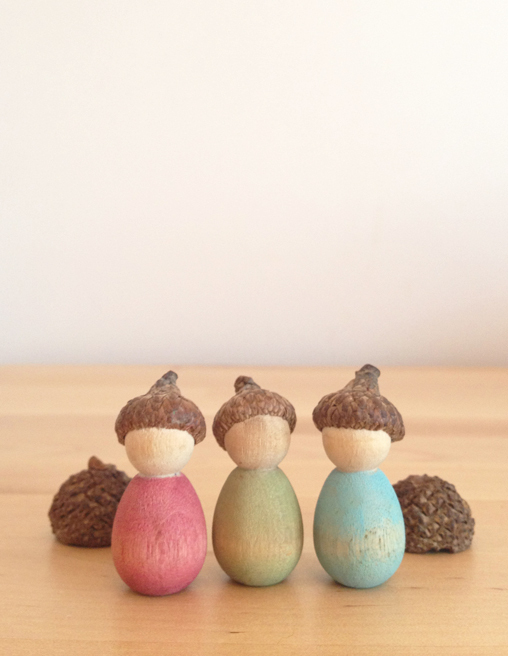 Thank you so much, your little acorn people are so very sweet as well!